Sat, Mar 23, 2019, 12:32 pm SL Time, ColomboPage News Desk, Sri Lanka. Mar 23, Colombo: Protecting Sri Lanka's sovereignty and independence and declaring the trust in our justice system at the UNHRC in Geneva, this government clearly fulfilled Sri Lanka's first Prime Minister D.S. Senanayake's objective of an independent country, Prime Minister Ranil Wickremesinghe said. The Premier recalled that Late Prime Minister D.S. Senanayake was the only leader who, in 1942 called on Asian nations to unite democratically and friendly to rise as independent nations. Prime Minister said the objectives of the Father of the Nation have been fulfilled today. The Prime Minister made these remarks while participating in a commemorative event yesterday. 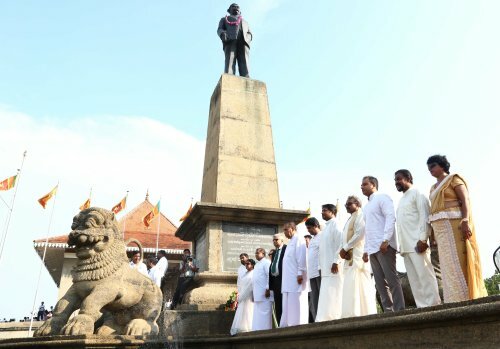 The commemoration of 67th death anniversary of Late Prime Minister D.S Senanayake and offering floral tributes to his statue at the Independence Square were held under the aegis of the Prime Minister Ranil Wickremesinghe and Speaker Karu Jayasuriya. 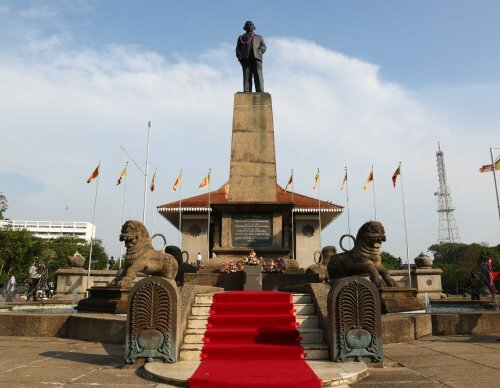 D S Senanayake led Sri Lanka's struggle to obtain independence from the British colonial rule and became the first Prime Minister of Sri Lanka in 1947. Speaking at the event, Prime Minister Wickremesinghe said whether knowingly or unknowingly former president Mahinda Rajapaksa and former UN Secretary General Ban ki-Moon signed an agreement on the 29th May 2009. The UN Secretary General informed the Sri Lankan government of the process of accountability and responsibility of government in the violations of human rights. The government has accepted it and promised to take steps to rectify but it was never clearly stated how it would be done. "The government at the time agreed to go to international court. However everyone got frightened after agreeing to the UN. Then nobody could leave country. Then our leaders afraid of arrest have to rush from London," the Premier said. "But we took the responsibility and said that democracy is being implemented in this country, the law is being enforced. We said that if the security forces or LTTE acted outside the law they will be prosecuted. But we did not ask international tribunals to try our cases. Our government's stance has been accepted by the world. The world's countries say democracy in Sri Lanka is alive." "They say we are taking war heroes to Geneva. We do not need to do that. If the law has been violated, the law can be enforced in this country. However, we have sent our soldiers to the United Nations Peacekeeping Force in Mali. That is what we learned from DS Senanayake." Ministers Thalatha Athukorala, Akila Viraj Kariyawasam, Ranjith Madduma Bandara, Daya Gamage, State Minister Ruwan Wijewardene, MPs Wasantha Senanayake, Harshana Rajakaruna, Colombo Mayor Rosy Senanayake, Former Minister Rukman Senanayake, D.S. Senanayake commemoration society members and distinguished guests participated in the event.